Clarien Bank announces 126% increase in net profits - larien Bank Limited (“Clarien”), a wholly-owned subsidiary of Clarien Group Limited (“CGL”) today announced a net profit for 9 months ended September 30, 2018 of $7.3 million – a 126% increase over the previous 12 months. NCB shares hit new high- NCB Financial Group hit an all time high during Monday's trading of the Jamaica Stock Exchange (JSE). Jamaica's World-Beating 233% Stock Rally Continues Full Steam Jamaica’s spectacular stock market rally, the world’s biggest over the last five years, shows no sign of losing steam. Big backing for ReadyTV – Lee-Chin’s AIC now single largest shareholder - Michael Lee-Chin's AIC Jamaica Ltd has taken a significant equity stake in Ready Communications. Michael Lee-Chin Appointed to Order of Ontario - The Order of Ontario recognizes individuals whose exceptional achievement in their field have left a lasting legacy in the province, in Canada and beyond. 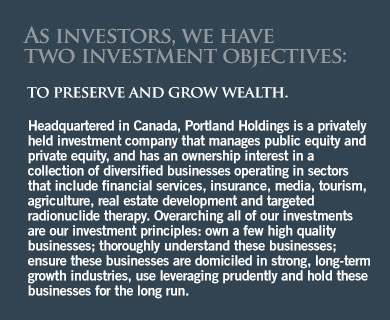 Portland fund invests in fifth venture Portland Private Equity, chaired by Michael Lee-Chin, has poured US$17 million into financing the merger of two iconic restaurant chains in Colombia though its Caribbean Fund II.